Low Challenge is a low ropes course designed to challenge you individually as well as a group. The Low Challenge elements set 1 ½ feet off the ground. Check Out Our Low Ropes Elements! Whale Watch—Moving back and forth, try to balance the situation out. Spider’s Web—You'll only have a few chances to get through. Oh, and be careful not to wake the sleeping spider! Deluxe Mohawk Walk—These elements can either be used as one continuous challenge walk or as individual challenges. Two Line Bridge—With only a rope to hold onto how far can you go? Single- and Multi-Line Traverses—Can you walk a cable? 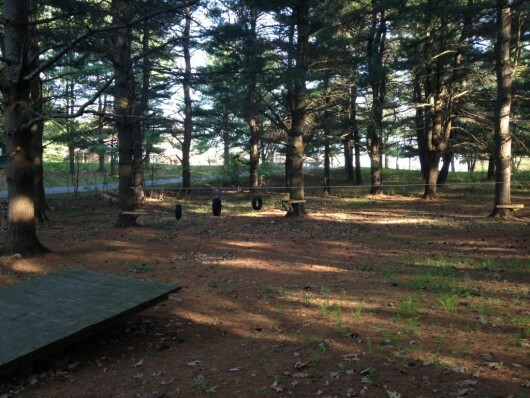 Tire Swings—Swing yourself from one tire to the next! Rope Swings—Try to get from platform to platform with using only the ropes. Wild Woozy—With only two of you to make your way across, support each other by stretching the farthest. Spider Wall—Make your way around the wall to looking like a creepy crawler.